1. The power (P) transmitted by all the systems is same. 2. 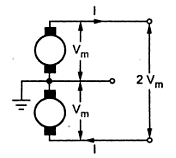 The distance ( l ) over which the power is transmitted is same. 3. The power loss (W) in all the systems are same. 4. 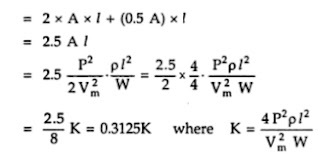 The maximum voltage (Vm) exists between any conductor and the earth, in all the systems. Based on these assumptions, let us compare the various types of systems for the volume of copper required. 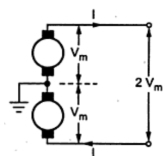 The maximum voltage between the conductors is Vm, as one material is earthed. The volume of copper required for other systems is compared by taking volume of copper required for this system as base. 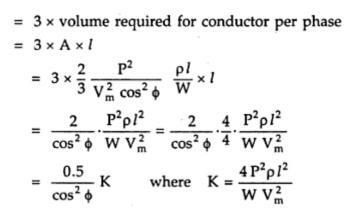 Let it be constant K and volume of copper required for other systems can be expressed interms of K.
The system is represented in the Fig. 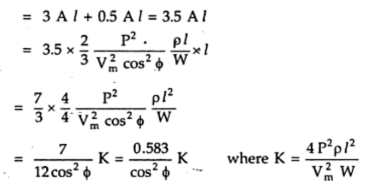 2.
where A = area of cross-section of each line. Thus the volume of copper required in this system is one fourth the volume of copper required for two wire d.c. system with one line earthed. The system is represented as shown in the Fig. 3. 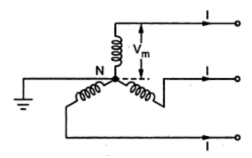 When the load is balanced, current through the third neutral wire is zero. 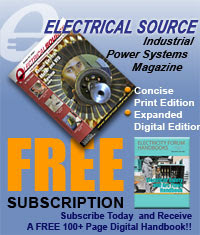 Let area of cross-section of the middle neutral wire is half of the area of cross-section of the outer conductor. Thus the volume of copper required in this system is 0.3125 times the volume of copper required for two wire d.c. system with one line earthed. This is most commonly used system for the transmission. The three phase three wire star connected system with neutral earthed is shown in the Fig. 4. 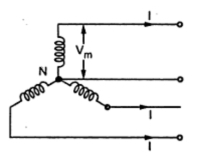 The maximum voltage between each line conductor and the neutral is Vm as shown in the Fig. 4. 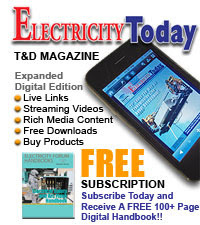 Thus the volume of copper required depends on power factor of the load and it is 0.5/cos2Φ times the volume of copper required by twp wire d.c. system with one line earthed. This system may be delta connected but irrespective of the method of connection star or delta, the result derived remains same. This system is popularly used for secondary distribution. The neutral is also made available for the connection of the load. The system is shown in the Fig. 4. Assuming the load balanced, there is no current flowing through the neutral. The cross-section area of neutral is half the cross-section of each conductor i.e. 0.5 A where A is cross-section of each conductor. Hence all the calculations upto the copper losses and expression of A remain same as derived for three phase three wire system. Thus the volume of copper required is 0.583/cos2Φ times the volume of copper required by two wire d.c. system with one line earthed. over head transmission lines planning, routing, and design and material supply within a stipulated time schedule is really must.